Via the anti-Planner, comes this amazing slide from a presentation by the city of Omaha on their new initiative for "Livable Transportation" (ppt presentation). Ray LaHood recently asked that all transportation authorities include "livability" in the next round of their 5-year transportation plans. What does "Livability" even mean? Well, I was not sure. This is one of those vague happy-sounding words that give liberals a hard-on in the context of government programs but generally just end up being an excuse for the exercise of state power at the expense of individual choice. I kid you not -- the two key steps in livable transportation are apparently increasing delay in auto commutes and increasing the cost of auto commutes. Wow, that certainly sounds like something that will make my life better (on the bright side, it strikes me as a goal that the generally-incompetent government can actually achieve). Of course, the issue is not really about livability, but about the imposition of a few intellectuals' disdain for cars on the rest of us. And if you want to look for the financial incentives, the size of government per passenger-mile of commute is maximized with rail mass transit. First, this is because rail is simply more expensive than driving -- way more expensive - - per passenger mile in any Western city like Omaha, even when all the costs of driving are considered. Second, with rail, the government nationalizes things like driving and maintenance that you do yourself or are done by private actors, and brings them in-house to be performed by powerful government unions. Postscript: Left unsaid in any of this presentation is how increasing commute delay leads to keeping jobs and businesses in the lower left. That strikes me as a non sequitur of epic proportions. Argh. I know people who work in environmental consultancies and argue this kind of BS all day long, but to see a city adopt a plan to spend tax revenue to make their citizens lives immediately worse... I am speechless except for my frantic sputtering. But you miss the point. Rail is more expensive but the drivers and workers are union and will vote Democrat. The contractors and construction crew are union and will get big paychecks and the union takes a big slice of that and gives it to Democrats. And the decision makers don't pay the taxes the stupid citizens do. This is a win/win for Democrats and unions. Who cares about the taxpayers. Not sure how it helps "Main Street" to make it less accessible to people. Went through Omaha last year and stayed the night. It struck me as pretty dispersed for a city that's not terribly large. What I found particularly interesting was the last slide in the transportation presentation. In the last slide, there is a chart that shows that there is a supposed tradeoff between vehicular service (which I assume to be car usage) and livability. So, we seem to have a definition of what is considered "livability," it is apparently the lack of automobile usage. What is also interesting is that they seem to automatically assume that we are at a point where a very small decrease in vehicular service will result in very large increases in livability. However, where this justification comes from is unknown, just like the unsupported assumption that increased delay will result in more jobs and business. Oh well, at least they're honest about their objectives. In the last slide, there is a chart that shows that there is a supposed tradeoff between vehicular service (which I assume to be car usage) and livability. Yes. Theirs is a zero-sum world. If I remember correctly there was a push several years to raise parking rates in downtown Phoenix because they were considered too low. The interesting thing to me for years is that the "livability" problem, (or whatever euphemism they are using today) is caused by smog and pollutants from exhaust. So, tell me, what creates more concentrated pollutants: 100K cars driving 30 minute avg trips across LA (or Phoenix, or San Antonio), getting to their destination and turning off their engines, or 95K cars making avg 1 hour trips (of a similar a similar distance) but mostly driving at low speed, accelerating and decelerating in accordion fashion, before reaching their destination and turning off the engine? The answer can be found in the gas-mileage of the two driving modes. In San Antonio, they have gone to pains to INCREASE congestion on a number of streets in an attempt to convince us to go with toll ways and light rail. While it's true they may have taken 5K cars off the fictional highway system above, they've increase the pollutants by about double in doing so. How is that more "livable" for anybody? This graph has underpants gnomes written all over it. I worked in Omaha for seven years. Omaha is a sprawling and growing city whose center continually moves westward (because it has the Missouri River to the east). Mass transit is and was a joke. The handful of bus lines could not and cannot serve even 5% of commuters. There are only two ways to reduce commutes in Omaha: have more people work from home via telecommunication or build living areas adjacent to work areas (a scheme that does little for two-worker households, is impractical in most instances due to zoning issues, and has no appeal to those who wish to live in suburbs). 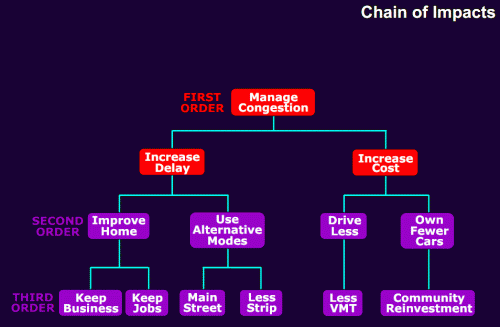 Omaha's auto transportation problem stems directly from an inability of city politicians to widen existing streets and to build elevated highways above Dodge Street (the main east-west route) and above 72nd Street (the main north-south route). The existing I-480/75 north-south highway is nearly worthless: it is too far east, and it dead-ends less than 3 miles north of "downtown" Omaha without coming close to connecting with the I-680 loop highway. Omaha's politicians won't adjust to the fact that "downtown" Omaha (where the government buildings sit not far from the river) has been at least five miles east of the true center of the city for over thirty years. Liberals have become fixated on the past. They insist we adopt a living model from the 1890's and a temperature from the 1950's. They call it progressive. Headline from the future: "Omaha road rage incidents up 20%"
After doing some digging around, I'm not sure this is an actual plan sponsored by the city although I haven't found firm documentation. From what I gather, this was the outcome of some Fantasy Urban Planning League (that's what I call it, others might call it Sim City: Sadist's Edition ) submitted by "young professionals" somehow loosely correlated with the Omaha Chamber of Commerce. Somewhere in the mix was a PhD candidate from UNO as well. Here is the Curse of Omaha: Some knucklehead goes to another city and sees something really cool and thinks it should be imported here. With private business, at least people have the choice to help it succeed or stand by and watch it burn to rubble. The dangerous knuckleheads are those who see public works and think they should be imported as well. The story always starts off the same: Focus on what you like about that other city's public services while completely ignoring the costs and consequences aside from a shallow nod. I know, I know, this is the curse of every city. But you'd think that with enough shining examples of public works stupidity in front of us, someone with half a brain might have at least a quarter of a clue. @colson You should read Warren's previous post on Detroit light rail and the "cargo cult" mentality of planners. It describes exactly what you are talking about. The "keep business" in the lower left refers to small and locally controlled businesses on Main Street, rather than big box retailers like Wal-mart or Target on the edge of town, which is seen as desireable regardless of whether that means higher prices or lower selection for customers.